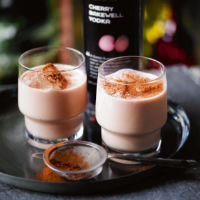 If you're a fan of Bakewell pudding, then rustle up this cocktail by Heston Blumethal. Place all the ingredients in a cocktail shaker filled with ice. Secure the lid and shake vigorously for 20 seconds, then strain into a rocks glass filled with ice. Garnish with a dusting of cocoa powder.